A major bribes-for-votes scandal that has been brewing for the past month and a half in Brazil, and may even extend to previous administrations, threatens to topple President Luis Inácio Lula da Silva, as federal prosecutors and parliamentary investigative committees close in on his administration. The present article follows closely the chronology of events contained in the pages of São Paulo’s O Estado de São Paulo, one of Brazil’s largest newspapers, Rio’s Jornal do Brasil and A Folha de São Paulo, two other major newspapers, as well as the news magazines Veja and IstoÉ (among other periodicals) — the latter two magazines having played a major part in breaking the story of the scandals. It all began on May 14, when the weekly Veja published a report that brought to light the existence of a bribery scandal at the Brazilian Postal Service. The report relied on a videotape wherein the ex-chief of the Contracts and Supplies Management Department, Maurício Marinho is shown receiving $3,000 Brazilian reals in cash as an “advance” so that private companies could become suppliers for the state-run entity. The scheme allegedly led by the president of the Brazilian Labor Party, Representative Roberto Jefferson of Rio de Janeiro, also counted on the participation of and concealment by Marinho’s boss, Antônio Osório Batista, and his assistant, Fernando Godoy, against both of whom indictments for corruption and bid rigging have been brought. On May 18, the opposition petitioned for the opening of a parliamentary inquiry commission into the scandal at the Postal Service — the equivalent of a Congressional investigation committee — obtaining the signatures of 230 of Brazil’s 513 representatives in the Chamber of Deputies, and 46 of Brazil’s 81 senators. The government tried to squelch the parliamentary investigative committee, but failed when the petition to open the committee was approved on May 25 with the support of 14 representatives and one senator, Eduardo Suplicy (São Paulo). Concurrently, the Estado de São Paulo published an interview on May 20 in which economist Lídio Duarte, ex-president of the state-run Brazilian Reinsurers Institute (I.R.B. ), said that Roberto Jefferson asked him to meet with Labor Party Representatives Nelson Marquelli (São Paulo) and Elaine Costa (Rio de Janeiro), who asked him for jobs for protégés, thus making the I.R.B. the target of another scandal. On June 3, Veja uploaded the recording of an interview with Duarte in which he says, president of the center-right Labor Party, required that he pay a monthly kickback of $400,000 Brazilian reals in return for his naming Duarte to head the I.R.B. Duarte had been a career officer in the state-run company and said that he tendered his resignation on account of the strong pressure he was under to pay the money to the Labor Party. On June 6, the Folha de São Paulo published an interview with Roberto Jefferson. In the interview, Jefferson revealed that the treasurer of the ruling Worker’s Party, Delúbio Soares, paid monthly kickbacks of $30,000 Brazilian reals to right-wing Progressive Party and center-right Liberal Party representatives in the Brazilian Congress so they would vote with the ruling party; that these kickbacks continued until January of this year; and that they only ceased when Jefferson himself informed President da Silva. Jefferson called the monthly kickback scheme mensalão, or big monthly, and named advertising executive Marcos Valério, owner of the DNA Propaganda and SMP&B Comunicação advertising agencies in Belo Horizonte, as its chief operator. Valério’s agencies were responsible for the accounts of several public entities. Although Delúbio Soares at first denied all accusations, he quit the post of Cabinet Minister two days after Jefferson’s interview and resigned as treasurer for the Workers’ Party on July 5. Again on June 11, in an interview for the Folha de São Paulo, Roberto Jefferson denounced the mensalão. He maintained that the kickback was paid in cash, came from state owned and private companies, and was carried in briefcases by two “operators,” the leader of the Progressive Party in the Chamber of Deputies, Representative José Janene (Paraná) and Marcos Valério, henceforth dubbed Marcos Valise by the press. On June 14, Jefferson gave testimony before the Chamber of Deputies’ Ethics Committee, accusing the heads of the ruling Workers’ Party and Chief Cabinet Minister José Dirceu of directing a corruption scheme that ranged from the so-called mensalão to the creation of separate books (so-calledcaixa dois) for the electoral campaigns of allies. Besides its treasurer, Delúbio Soares, among those he accused in the Workers’ Party were its secretary general, Sílvio Pereira, its president at the national level, José Genoino, and its communications secretary, Marcelo Sereno. During his deposition before the Ethics Committee, Jefferson stated he had spoken about the mensalão with six cabinet ministers, four of whom confirmed his account, and two who denied it — José Dirceu and Economy Minister Antônio Palocci. Three of the ministers — Tourism Minister Walfrido Mares Guia, National Integration Minister Ciro Gomes, and Communications Minister Miro Teixeira say they refrained from apprising President da Silva for lack of evidence. The Labor Party also partook in the scheme through the intervention of Workers’ Party president José Genoino (dubbed José Ingenuino by the press), and the money was delivered by its treasurer. Jefferson did not advance any evidence for his allegations. On the same day Roberto Jefferson deposed before the Ethics Committee in the Chamber of Deputies (the equivalent of the House Ethics Committee), the financial counterpart of the independent newsmagazine IstoÉ, its sister publication IstoÉ Dinheiro, published an interview with Marcos Valério’s former secretary, Fernanda Karina Somaggio, who retold how “suitcases of money” were withdrawn from the Rural Bank and the Bank of Brazil under his orders for alleged payments of bribes to government officials. Interestingly enough, she accused Communications Minister Pimenta da Veiga of the former president Fernando Henrique Cardoso’s administration of receiving payments from SMP&B Comunicação, one of Valério’s advertising agencies. The following day, during statements to the federal police, Somaggio retracted her accusations, but then changed her mind and stood by them, telling the Globo Network’s Jornal Nacional on June 28 that she had received death threats. She said she feared reprisals from her former boss. “The magazine IstoÉ Dinheiro systematically sought out advertising executive Valério to afford him the same space and prominence accorded his ex-secretary, in order that he put forth his account of the facts, making use of the same vehicle that opened its pages to Karina Somaggio. It did not receive an answer, despite repeated entreaties. On June 16, 50 hours after Roberto Jefferson’s denunciations, Cabinet Chief José Dirceu resigned his post in order he said “to better prepare my defense.” Dirceu denied all accusations and said his hands were clean. He attributed the denunciations to maneuvers by “the opposition and the country’s elites.” In his place, President da Silva appointed Dilma Rousseff. Dirceu is an ex-leader in the student movement who terrorized the military dictatorship and who, once he was imprisoned as a result, ended up on the list of those exchanged for United States Ambassador Charles Burke Elbrick, who had been kidnapped by urban guerillas in 1969. Bruno Barreto’s film Four Days in September, which featured Alan Arkin in the role of the ambassador, and which received the award for Best Foreign Language Film when it was released in the United States in 1997, was itself based on the memoirs of one of the guerillas, Fernando Gabeira, who lived in exile in Sweden until 1979 and is today a representative for the Green Party in the Chamber of Deputies. Unsurprisingly, the State Department denied his visa to attend the award ceremonies. The following day, the treasurer of the center-left People’s Socialist Party of São Paulo, Rui Vicentini, told O Estado de São Paulo that Workers’ Party representatives offered his party $4 million Brazilian reals in return for his party’s support of mayor Marta Suplicy in the Chamber of Town Councilors. According to Vicentini, the offer was made last year by the party’s secretary general at the national level, Sílvio Pereira, and then by the municipal communications secretary, Valdemir Garreta. Again, according to Vicentini, if the offer were accepted, the party’s national treasurer, Delúbio Soares would authorize the payment of an advance of$2.5 million Brazilian reals. On June 21, Karina Somaggio, under the advice of a new lawyer, reaffirmed the denunciations she had retracted the previous week in statements to the federal police, corroborating Delúbio Soares and Sílvio Pereira’s involvement in the kickback scheme, along with that of other participants. On June 25, IstoÉ magazine, relying on data contained in a report of the Financial Activities Monitoring Committee, made public the findings that two of Marcos Valério’s advertising agencies — SMP&B Comunicação and DNA Propaganda — had made cash withdrawals totaling $20.9 million Brazilian reals between June 2003 and May of this year. The money was issued almost entirely from a branch of the Rural Bank in Belo Horizonte, the capital of the Brazilian state of Minas Gerais, and a small amount, from a branch of the Bank of Brazil. The report was prepared with bank data of withdrawals greater than $100,000 made by its clients. On June 29, in the absence of the governing base in Brasília, the opposition installed yet another parliamentary investigative committee in Brazil’s Senate, the committee of the bingo houses, thickening still further the confusing porridge of investigations afoot in the capital. Its aim is to investigate suspect activity in bingo houses. That same day, the government struck back by calling for a committee to investigate the alleged purchase of votes for former president Fernando Henrique Cardoso. Also on that day, the committee investigating the Postal Service scandal authorized the rescinding of advertising executive Marcos Valério’s bank and telephone privacy. On June 30, an article in O Estado de São Paulo showed that between July 2003 and May 2005, advertising executive Marcos Valério moved monies at least twice as great as the $20.9 million Brazilian reals he had withdrawn from the Rural Bank and the Bank of Brazil, according to a report released by the Financial Activities Monitoring Committee. Also, three directors of Furnas Centrais Elétricas (the state owned electric company) resigned amid new revelations made by Roberto Jefferson of the center-right Labor Party in the pages of the newspaper A Folha de São Paulo of the existence of a scheme to divert money from the state owned company to the Workers’ Party. According to the representative, of the $3 million Brazilian reals embezzled, $1 million would go to the Workers’ Party at the national level, through Delúbio Soares, and $1 million to the Workers’ Party in the state of Minas Gerais. The remainder would be divided between Furnas’ management and a group of representatives. On July 3, in a report in Veja, it was revealed that advertising executive Marcos Valério was the guarantor of a loan taken out by the Workers’ Party in the value of$2.4 million Brazilian reals. Since the party did not honor the monthly financing of exactly $349,927.53, it was up to Valério to pay it. 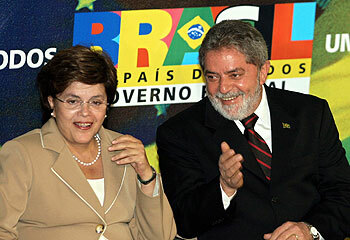 The loan was taken out a month and a half after President da Silva took office on February 17, 2003. Fernanda Karina Somaggio also told Globo Network’s program Fantástico that Valério also met repeatedly with the leader of the centrist Party of the Brazilian Democratic Movement in the Chamber of Deputies, José Borba, and that her boss had taken a suitcase full of money to Borba. On Sunday, July 3, the Folha de São Paulo reported that the president's son, Sandro Luiz Lula da Silva, was a salaried I.T. employee of the Workers' Party, but that the position was a sinecure: he never showed up for work. So far, it appears President da Silva has not been touched by the whirlwind of scandals that currently assail his administration. Opposition leaders, still, are loath to implicate President da Silva in the scandal. Former president Fernando Henrique Cardoso (Social Democratic Party) was quoted in Le Monde as saying that “until now, nothing indicates that President Lula is directly involved.” Senator Antônio Carlos Magalhães of the center-right Liberal Front Party is also quoted by Le Monde as saying “We have to save Lula, because two impeachments in twelve years is very bad.” Magalhães was referring to Fernando Collor de Mello’s impeachment in 1992. The scandal is significant, however, because the ruling Workers’ Party had based its campaign on the party’s fiscal and ethical probity. In interviews published by IstoÉ of automobile workers of Brazil’s “Detroit” — the three cities that comprise the ABC triangle in the state of São Paulo, Santo André, São Bernardo and São Caetano — most of the auto workers are behind da Silva, himself a former leader of automobile workers’ unions. On July 6, according to O Estado de São Paulo, federal police apprehended Parliament Secretary José Adalberto Vieira da Silva at Congonhas Airport in the south of São Paulo as he boarded a plane carrying a suitcase containing $209,000 Brazilian reals. He was also found to have $100,000 in United States dollars lining his briefs. The plane was headed for Fortaleza, capital of the state of Ceará, with a layover in Brasília. Silva is an assistant to Workers’ Party representative José Nobre Guimarães (Ceará) who himself is brother to the party’s president, José Genoino. On July 7, José Genoino, an ex-guerilla who had fought against the military dictatorship, tendered his resignation, maintaining his denials that the Workers’ Party never purchased votes or paid off representatives. His resignation had been preceded that same week by that of the party’s treasurer, Delúbio Soares, on July 5, and that of the party’s secretary general, Sílvio Pereira, on July 4. On July 15, the Folha de São Paulo reported that the day before, businessman Marcos Valério, accused of operating the mensalão scheme, had offered Brazil's attorney general, Antônio Fernando de Souza, his cooperation with the investigations in return for reduced penalties as the accused in an eventual judgment against him, but the attorney general refused, for two reasons: 1) the investigation is in its infancy and the extent of Valério's involvement is still unknown, and 2) it is still not known how much more information Valério could provide to aid in the investigations. The day before, on July 14, the Estado de São Paulo reported that the Bank of Brazil's Marketing and Communications Director, Henrique Pizzolato, 52, announced his request for early retirement after Fernanda Karina Somaggio told the committee investigating the scandal at the Postal Service that Marcos Valério had had frequent contacts with Mr. Pizzolato. Pizzolato's departure has been the third at the Bank of Brazil in less than a week. Earlier, the vice president of retail operations, Edson Monteiro, and the vice president of finance, Luiz Eduardo Franco de Abreu, resigned their positions. The Estado de São Paulo also reported that during a speech on the senate floor, the leader of the opposition Brazilian Social Democratic Party in the Senate, Arthur Virgílio (state of Amazonas) accused president Luiz Inácio Lula da Silva of being an idiot or corrupt. He said Lula can only fit one of two profiles: “That of being complicit in the corruption [scandal], or that of being a complete idiot for not knowing all that goes on around him.” He concluded: “I am saying here that, in the best of hypotheses, Mr. Lula, you are an idiot; in the worst, you are corrupt.” Virgílio pointed out that the opposition has made a show of “patience” in order that the president fulfill his mandate, “But we all know that a day past January 1, 2007 [for Lula], is not possible,” he insisted.